January was spent trying to finish my thousand cranes – a resolution I make every year and never quite finish. I figure a couple more years and they will be done. I do recommend this to any and everyone. It’s simple to do and is one of the most meditative things I have ever done. The weather was wintry and exquisitely beautiful. Each and every storm left behind a landscape that screamed to be walked through on snowshoes and photographed. The quiet that goes along with weather is restorative and I always look forward to a snowstorms aftermath. St. Patrick’s Day will be one of the most important days of the calendar year to me now, not because I’m Irish but because it was the day I talked to Scott for the first time. Given up for adoption in 1972 I had come to regard this moment as something that may never happen. I had left information on a website and through a convoluted chain of events was contacted through an intermediary. The rest of this year has been spent with each of us getting to know our new family members, a blessing in so, so many ways. 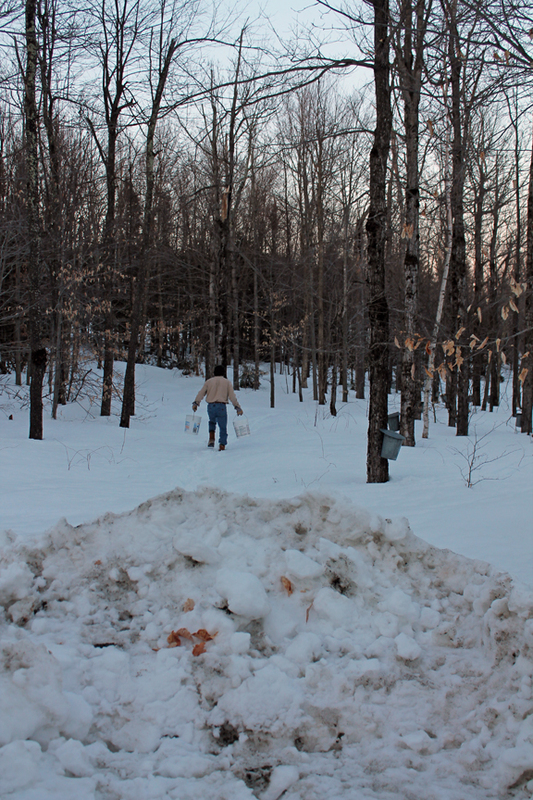 Sugaring this year was amazing although the snow was rather deep in the beginning. A lot of work gathering those buckets without the aid of snowshoes. 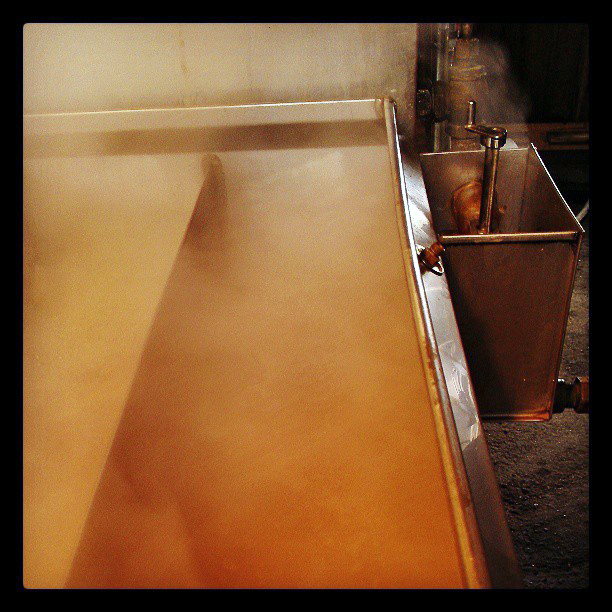 It makes up for it when we boil and smell that hot maple goodness wafting through the sugar house. Spring came in its normal time this year, no hot spells or odd cold snaps and the pear tree was happy. I made my first overshot throw in wool and discovered a passion for weaving that far and away exceeds any other handwork I have ever done. My grandfather had wanted me to weave I think, I have a faint recollection of receiving a small, plastic kids loom when I was very young but without someone to teach me. This has been a special journey with a connection to just about every member of my family. Every morning the weather cooperates this is what I look at as I drink my first cup of coffee. There is nothing like walking out the door in your pajamas and sitting in an Adirondack chair overlooking your land. Day to day the view is different, each having its own beauty. I feel very, very blessed to have this be such a big part of my life. It’s grounding. The end of summer brings with it the fairs. I took full advantage this year. Heath Fair is one of my favorites with something for everyone. I also had some validation with winning a blue ribbon for my weaving. Wood, wood, wood, we cut and split a lot of wood. It’s best when it’s like this – family all gathered to make it all go quicker and easier. It’s also more fun. Everyone pitched in and Chester thought is was awesome. Chester started swimming this summer. He is a very hot dog when the weather is warm but loves playing fetch more than anything. This was the perfect solution. He was a bit of a panic swimmer the first day but after that he looked forward to coming to this spot each and every day we were in Rowe, sometimes twice a day. He is an amazing animal. My garden had its issues this year but my popcorn, the experiment of the year was a complete success. There is no better feeling than finding out there is something new you can grow that’s beautiful and functional. I went to Belfast, Maine to Fiber College this year and spent quality time with old and new friends and ate lobster every day. It was a fiber weekend for some but for me it was more about photography. I need to be alone to do my best work and I came away with images that were everything I wanted them to be. It was also a time to reminisce about childhood, we spent many summers up this way while I was growing up and I hadn’t been here in a good 30 years. This autumn the foliage was more beautiful than I had seen it in years. So many of my friends shared exquisite images of scenes right out their front doors that were breathtaking. Photography slows me down and forces me to look at the details. The photograph above of the red tree was taken almost at dark. I drove by it in the center of town, said wow to myself and kept driving. By the time I got to the bottom of the hill I turned around to capture this. In my head I initially said “Oh, just take it tomorrow” but a few hundred feet down the road I realized that it wouldn’t be there. Those are the best photographs, the ones that catch that fleeting moment. This fall I saw some of the most amazing sunsets ever. Enfield never looked so good under these vibrant skies. This particular evening it seemed that everyone I knew posted a photograph from a different place. It was like the sky made everyone stop whatever they were doing to watch. It’s comforting to know that the people I love were all looking at the sky at almost the same time and then sending what they saw to others. Thanksgiving weekend was about family, our immediate family. What is usually a crowd was just Bill, me and the two girls, our nuclear family. It was the first time in so many years that it was just us and it was wonderful. It’s probably the most difficult thing to experience – the loss of your children to adulthood. The best time of our lives was raising our girls and they have both turned into amazing, remarkable women. It was good to have the opportunity to have them all to ourselves. For a treat Bill built an amazing bonfire to share with them and a couple of their cousins. Christmas has come and gone, although the remnants are still in the house. A few decorations will return to their boxes in a week or so and life will begin its new cycle. There aren’t any resolutions this year for me other than to absorb the gifts around me. The time seems to go by so fast each year it leaves me breathless. I will spend the winter months planning the garden, weaving and cooking for the people I love. I will follow in the rhythm of the seasons and work the way I do for each year. It may seem a little dull but planning my life around what’s growing or the weather is the most comfortable way for me to live at this moment in time, you just roll with it. I take every moment spent with the people I love and savor it like a fine wine. Those times of love and laughter are what sustains me through any other trials that come along. The simplicity of it is all I need. Bill, Carmen and Russell gathered sap Saturday morning on what turned out to be a very nice day. The estimate of sap was over 700 gallons. The RO was started and the waiting began. Russell was firing up the rig when we arrived around 3:00. 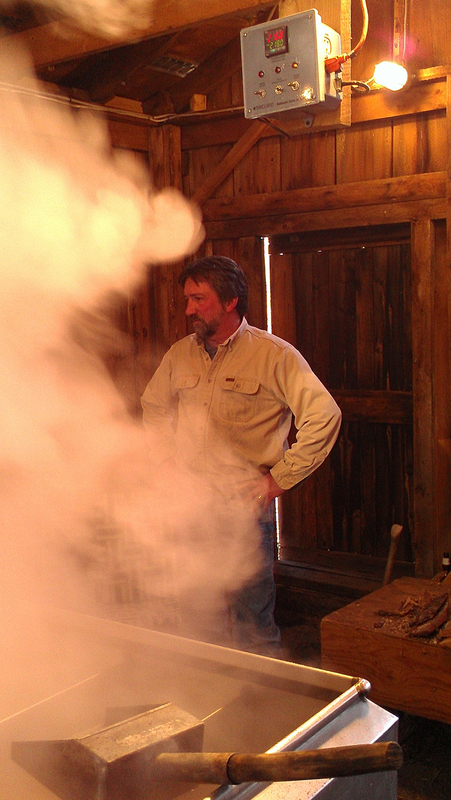 Boiling sap requires a lot of waiting and watching with moments of intensity. Russ has a lot of new electronic gadgets that we whine about but in reality it does make boiling easier. This year was a stack thermometer that lets you know when you need to stoke the fire. At the top of the above photo is a piece of equipment that is the automatic draw. This opens a valve on the pan that lets the syrup out into a pail when it’s the right sugar content. A lot of testing goes on when you first begin the process. Once you know the specific gravity of the syrup for that particular day the temperature is set. Russell tweaks it most of the afternoon always going for the best syrup possible. Bill doing his job as fireman. Poking and stoking. We burn slabs from a local sawmill – it looks like it’s mostly pine and hemlock – don’t quote me on that though. It is HOT in that sugarhouse once everything has been going for a while. The stack thermometer was over 1,000 degrees a number of times. Waiting and watching. As the syrup is drawn off it is filtered and put into a holding tank. 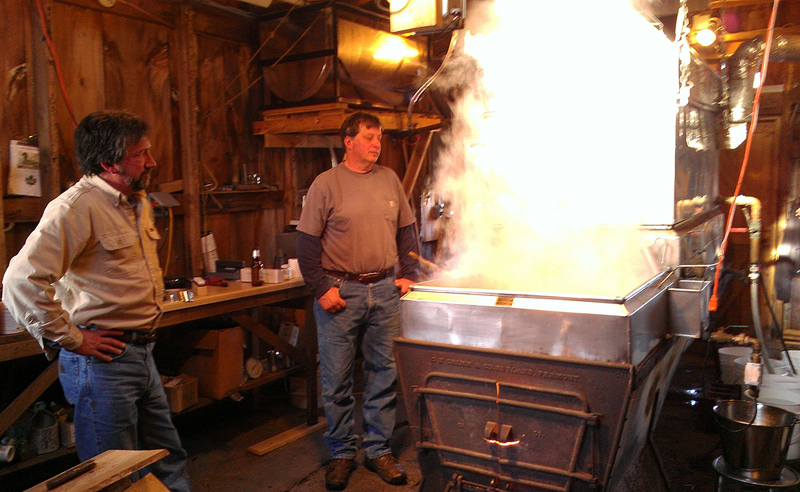 The tank holds about 12 gallons of syrup and has a gas burner underneath it that enables us to heat it up for canning. Russell is putting the fire out at the end of the boil. There is a stainless tank in the sugarhouse with a clear hose so you can see when you are coming to the end of the sap. You need to get that fire out and stop the process before your sap runs out or you will burn your pan. I always feel it’s a little bit of a panic at the end, you want to boil all you can but not enough to wreck your equipment. Tensions always begin to rise as boiling comes to an end. As the filtering is done and the holding tank is filled we begin to put the syrup in bottles. It’s not until you’ve canned every drop that you tally up what you did for the day. The old record was 22 gallons in one day, Saturday we did a little over 23. It is also some of the nicest syrup we’ve ever produced. While Carmen and I canned Russ cleaned up. Everything is washed down at the end of the session, it’s kind of a sticky mess but the sugar just melts away with water. We finished everything at 8:15. Any one interested? Think pancakes, waffles and french toast, yum. Quarts are $16, pints $10 plus shipping. Once you’ve had this you will never go back. We consider ourselves pure maple syrup snobs. I wish I could send the smell of boiling maple syrup to everyone reading this post. It is truly my favorite part of making it. You are engulfed in maple steam the whole time, it’s wonderful. Easter Sunday was the first day Bill and I boiled sap with Russell. Bill and Russ had gathered the buckets the day before and the reverse osmosis machine had done its thing while we shared an Easter dinner with family. We lit the fire at about 3:00 and finished at 5:30 making 8 gallons of syrup. Russ says he needs more taps now that he has the r.0. I think he’s right. Having so much of the water removed from the sap before we start to boil has cut the time to make syrup in half. We talked about how boiling used to take us hours. We’d start at 2:00 in the afternoon and maybe, just maybe be cleaning up at 1:00 in the morning. There have been so many improvements in the equipment over the years that just make it easier than it used to be. When we sugared years ago the men that boiled could tell when it was ready by how it flowed off of their scoops. Now there are so many different ways of measuring the sugar content of your syrup I think the art of making syrup may be lost, now it’s manufacturing. Well, almost. It’s still a lot of work. So after canning up our hot syrup and taking it away we got a call from Russell telling us he’s picking up all of the syrup we’d brought away with us – factory recall. It was cloudy so it would have to be heated and re-filtered. We were running blind in the filtering department with vague instructions Carmen had left behind when she went to work (she’s the expert). 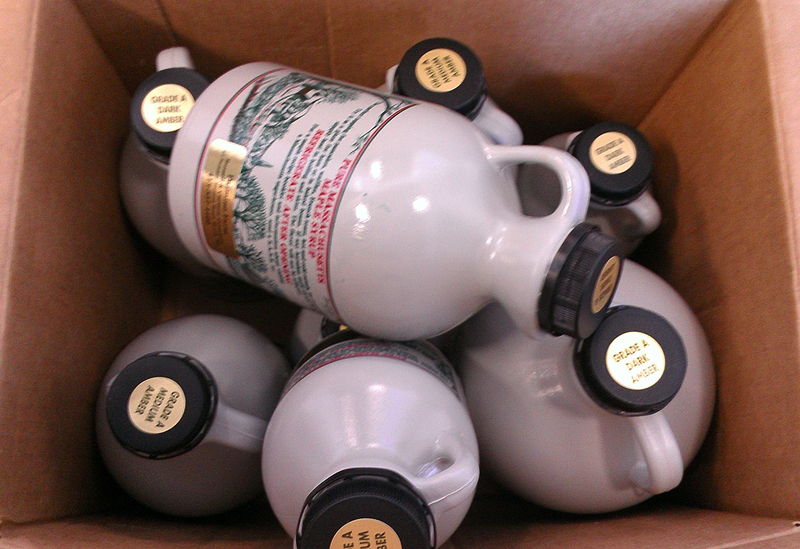 So back it went and our anxious customers will have to wait another week for their dose of fresh maple syrup. 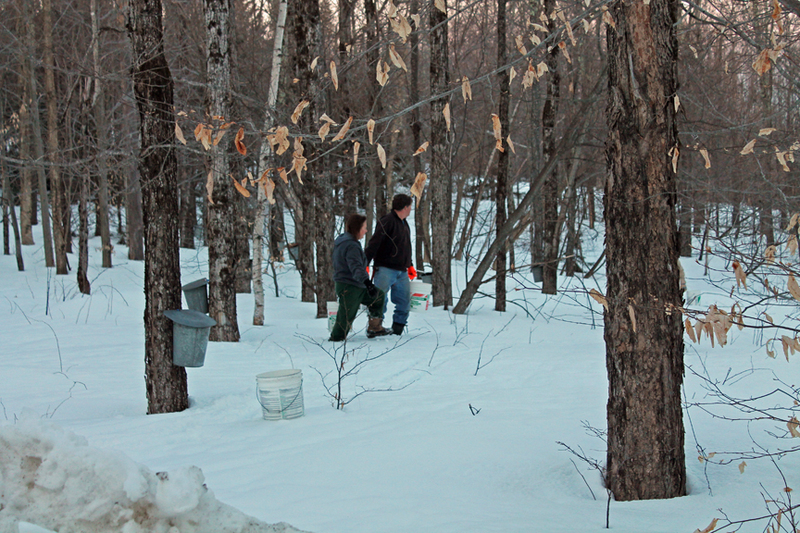 We gathered sap for the first time this past Saturday. The day was gloriously warm – over 50 degrees. As you can see by the muddy road spring suddenly sprung. Bill is pouring the sap gathered from the buckets on the trees into a tank behind the tractor (driving the tractor was my job). We started gathering just as the sun was going down. I’m not sure how many taps there were where there were buckets. 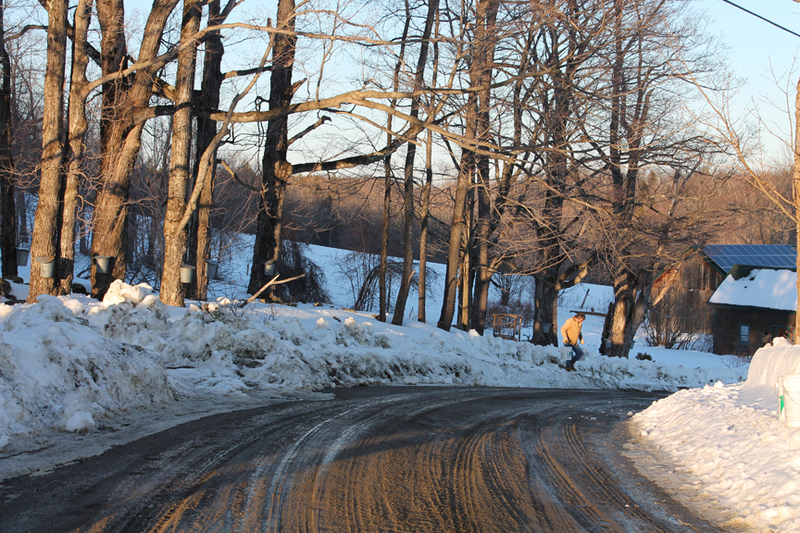 Most of Russel’s sugarbush has pipeline. This gather was particularly difficult because the trees were tapped before the last snowstorm so the walking was difficult. 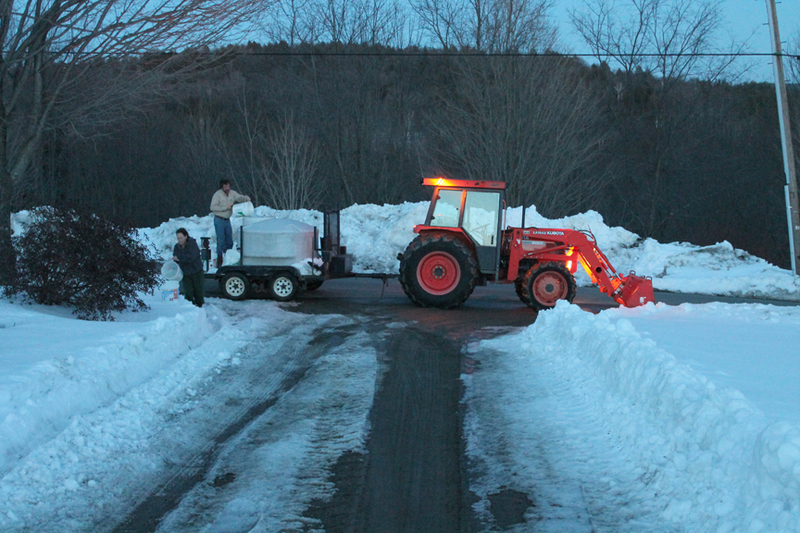 Especially since the town had winged back the snow banks. Does this look like fun?!? Although Russell wearing his florescent hunting gloves gave us fodder for ridicule. You always need something to laugh about when you’re doing something this tedious. The buckets were only about a quarter full on every tree so you didn’t really feel like you were accomplishing a lot. It was getting darker and I was wondering if we would be doing this in complete darkness before long. But as we continued to say, many hands make light work. If we thought about how long it would have taken with two people doing it this didn’t seem that bad. The photo of the tractor doesn’t really tell you how dark it was – there should be complete darkness with the headlights showing. The tank was probably a quarter full when we finished but Russ and Bill pumped the sap from the other storage tanks on the pipeline into the sugarhouse and it was enough to fill the rig and check for leaks. The first boil is a little more stressful than the rest because you don’t really know what kind of issues will crop up. The equipment is only used for maybe a month once a year, stuff happens. Sunday was even warmer than Saturday but the sap still isn’t running strong yet. 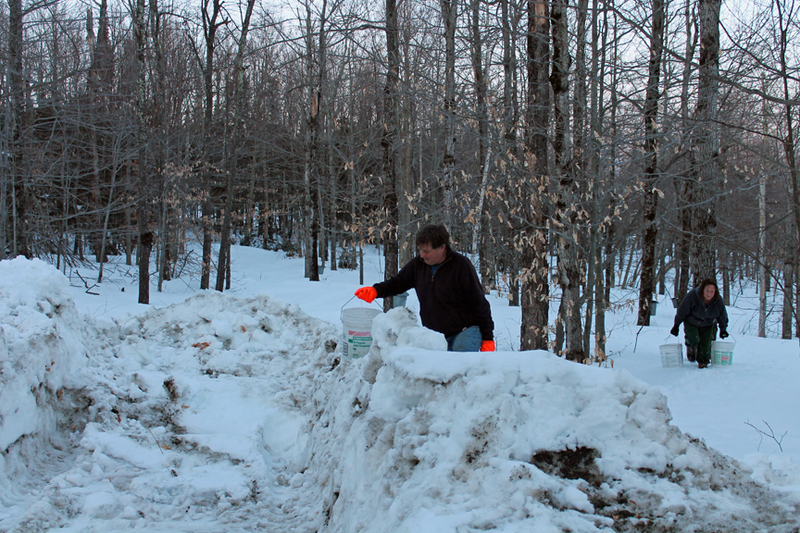 It may be that the snow is really insulating the feet of the trees, so as the snow melts the sap will run more. We’re looking forward to a nice long season this year. The forecast for the weather today is very mild – they say in the 40’s. 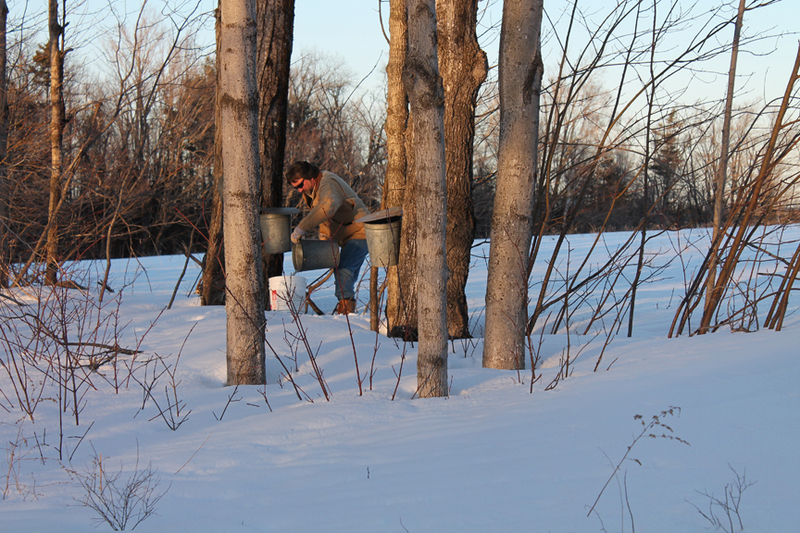 When that happens in January I always start thinking about maple sugaring. Bill and I sugar with our friends Russ and Carmen in the next town over. We do it because it is a really fun time (most of the time) and gives you a real sense of accomplishment. Russell and his son started laying the pipeline last weekend. Things will be ready when the time comes to tap the trees. The photograph above was the sugar house that was in the back of the house in Rowe. There are still remnants of the metal equipment that they used out in the wood lot although I confess I personally have not seen them. I’ve walked to that area a few times but what was once a sugarbush is now over grown with huge pine trees. 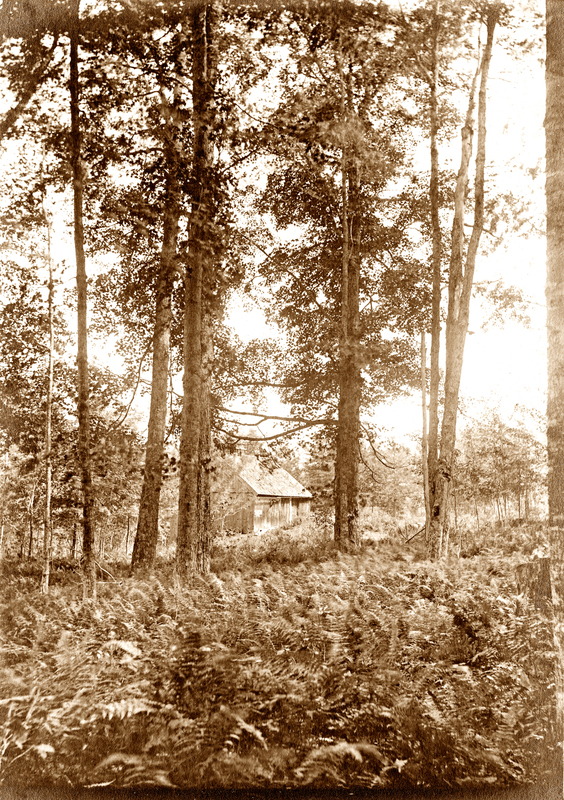 In the middle to late 1800’s there was a lot of maple sugar made on Fort Pelham Farm. The first record of it was in the 1860 Farm Census where 700 lbs of sugar was recorded for that year. 1860 holds the record for the most maple sugar ever made in the U.S. One of the reasons being this was the ramp up to the civil war and people were boycotting cane sugar due to slavery. They replaced a lot of that cane sugar with maple. In 1870 they produced 300 pounds and in 1880 they produced 450. I am assuming that pounds of sugar was both syrup and sugar but it may have all been sugar. Until 1860 there were only wooden spouts to tap the trees and iron pots to boil the sap in. 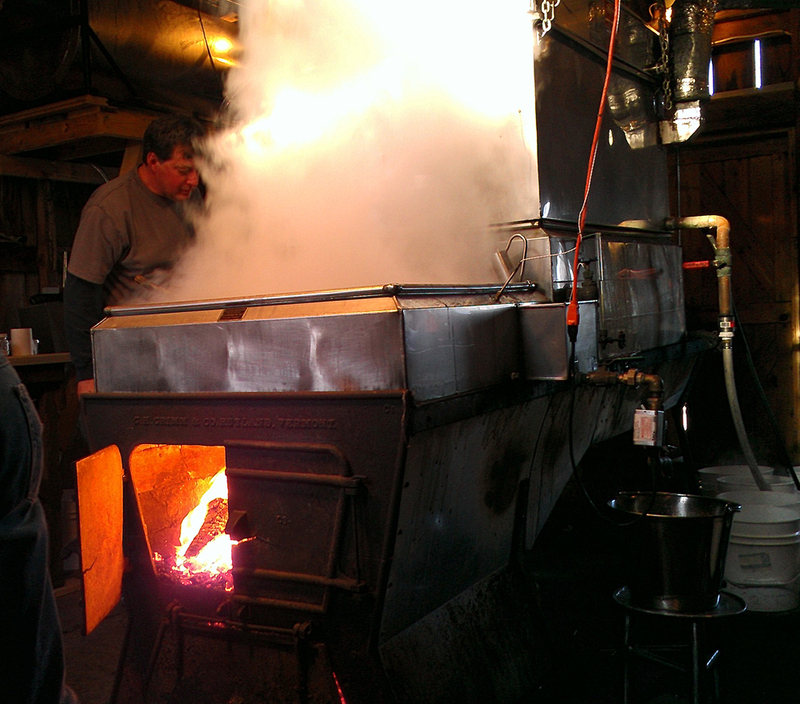 The process involved a number of pots at various stages of boiling so instead of having an automated draw down to syrup as we have today they were manually transferring sap from pot to pot until it reach the sugar stage that they were looking for. When I read that 700 lbs. of sugar was made it came as a huge surprise just considering the amount of work that is involve. So I decided to do some math. 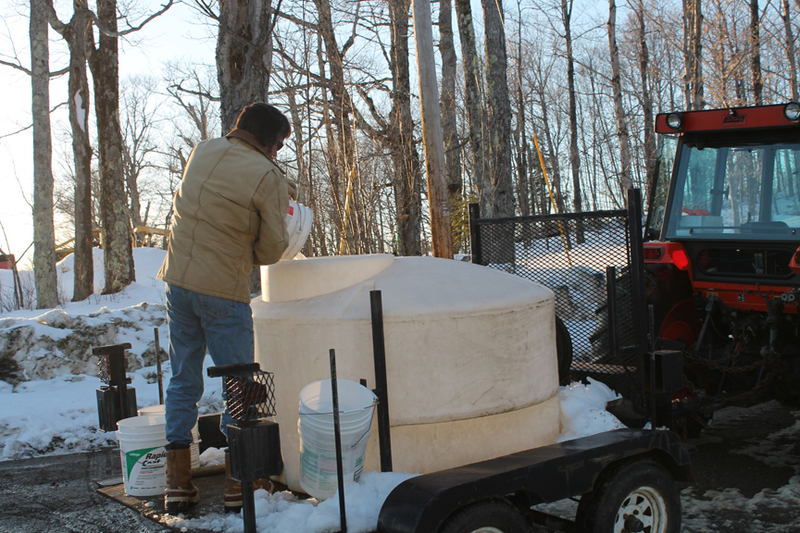 On the average, it takes 40 gallons of maple sap to make 1 gallon of pure maple syrup. One tap hole in each maple tree gives 10 gallons of sap in an average year. 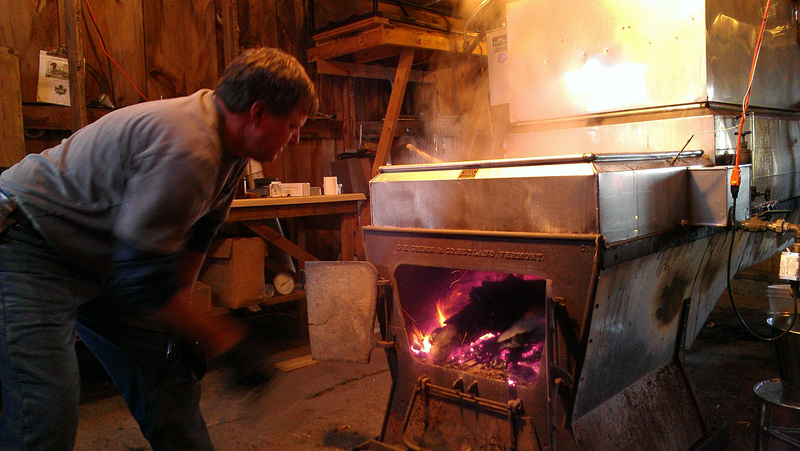 So, 4 maple trees, 40 to 200 years old, are needed to make one gallon of pure maple syrup. Some trees have more than one tap but all should be over 10 inches in diameter. Maple sap is 2% sugar and weighs 8.35 lbs. per gallon. Maple syrup is 66.9% sugar and weighs 11 lbs per gallon. One gallon of maple syrup makes 7 lbs of maple sugar. All I can say is wow. The best year we ever had was 2 years ago because it was a long season. We made 130 gallons of syrup. We had 1,000 taps on pipeline and about 200 buckets. 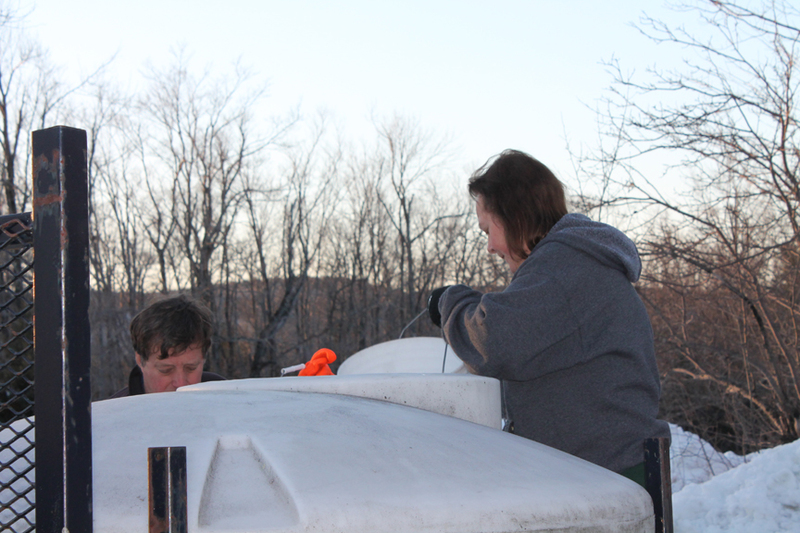 We used a reverse osmosis rig to take a lot of the water out of the sap before we even started to boil it. 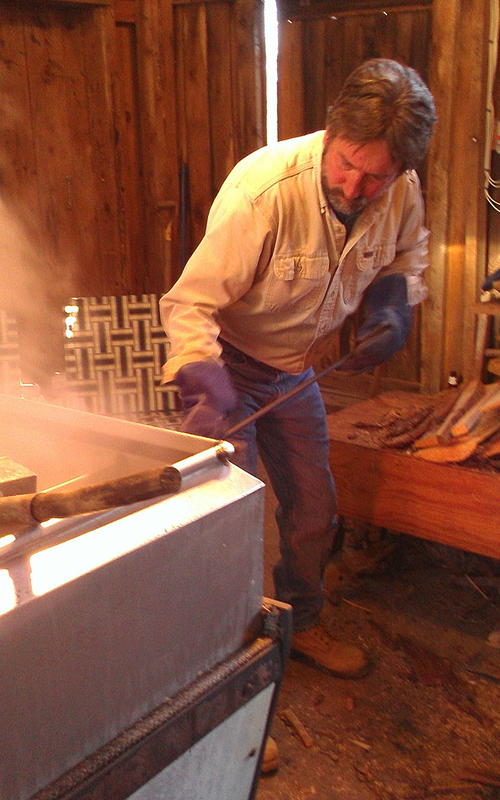 We burn slabs from a local sawmill and the fire is stoked every 4 minutes – yes, every 4 minutes. I’m not sure how much wood we burned. They were just using buckets to catch the sap. Each bucket had to be emptied at least once a day by a person, stored and boiled. They must have been boiling 24 hours a day everyday throughout the season. At the time on the farm they had two oxen which I’m sure were worked gathering sap. Fortunately the season is short. Then I remembered a conversation Bill and I had a couple of weeks ago about the amount of wood it would have taken to heat the house. We figured anywhere from 15 to 20 cord a year. 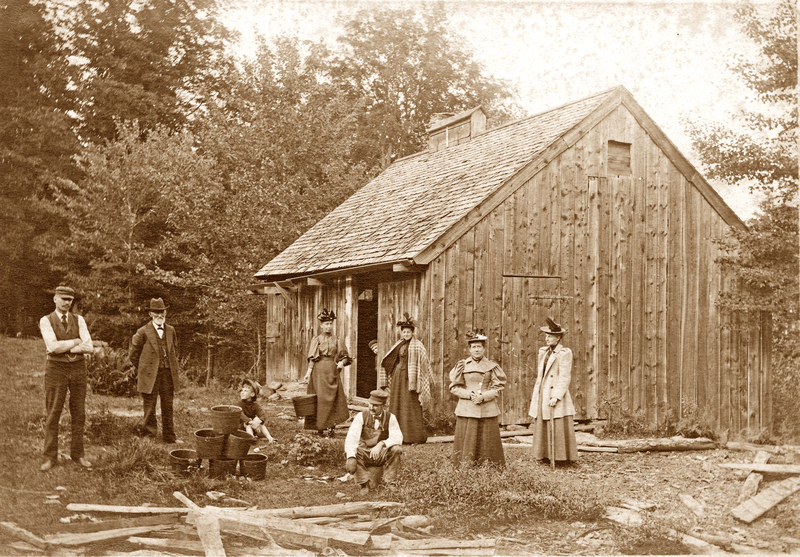 Add to that whatever they needed to make maple sugar and these men had to have been doing nothing but cutting wood year round – with saws, axes and mauls and those oxen. This is why they tell you that you could see to the ocean from Western Mass. Every tree had been cut down and burned by the time 1880 came around, that’s when people began burning coal. People always ask me why the price of syrup is so high and I always tell them how much work is involved in it. I don’t think we even get enough to justify any of our time, we do it because we love it. I can’t imagine thinking it was fun half way through the season in 1860. I’ve just spent the better part of this morning down a rabbit hole of genealogy which I have to admit happens quite often. It all started out with a thought about sugaring. 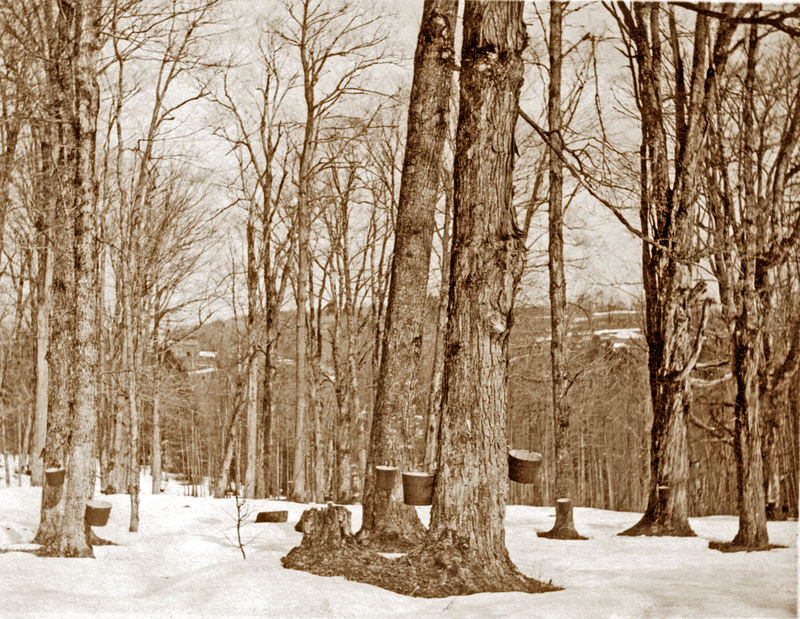 I figured I’d do a little research on what sugaring was like on Fort Pelham Farm in the mid to late 1800’s. I will still do that but that thought led me on a little adventure. This photograph was taken in the late 1890’s to early 1900’s. I decided to try and figure out who the people in the photo were as best I could. I have a number of other photographs with the names of people on them so I figured I’d just have to do some comparisons and maybe I could have an idea of who each person was. The man farthest to the left is most likely Henry Wright, the next older gentlemen is Edward Wright. The woman next holding the bucket is Charlotte Mills. I think the man kneeling down is Lucius Wright but I could be wrong on that one. The last one I know is Daisy who is second from the right. In dating old photographs one of the clues is in the clothing they were wearing. Daisy’s jacket is really of early 1890’s vintage. The rest of their clothes could be anywhere from 1890 to 1910 so we can probably assume that residents of Rowe were not on the cutting edge of fashion. I figured I’d look at the marriage date for Henry and Daisy Wright since they are together on the farm during sugar season. January 1, 1903 they were married. Then it happened. I opened the 1900 census for Daisy Negus and find her living with her aunt and uncle as a servant. Hmmm, now how are J. Frank and Mary E. Brown related to her. I search their family trees to find that they lived in the house next door to Fort Pelham Farm and Mary was Daisy’s mother’s sister. In addition to finding out they were neighbors I read on to find out that J. Frank and Mary were killed in a railroad accident in Zoar on December 21, 1903. Wow. None of this really had anything to do with my quest to identify people in the photograph but these little searches sometimes do enlighten you about circumstances that you may never have known about. Daisy was Wright’s neighbor for a number of years as she was listed as a servant for her aunt and uncle who rented out rooms next door in the census. She was born in Readsboro, VT so I often wondered how they came to know one another. Mystery solved. That left a lingering question for me – how did they all feel on that tragic day in December 1903? It’s something I can only imagine.